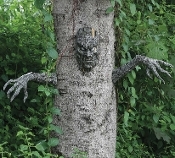 Realistic Spooky Living Tree Prop Decoration. Make the trees in your yard look alive! Add this scary head and arms prop decoration to give your tree frightful character. Uses plastic picture hanger-type tabs. Manufacturer suggests driving a very thin wide headed nail into the trunk and hang them on. *Please note: These are lightweight molded plastic, which may be damaged or lost by wind. We use clear fishing line wrapped around top and bottom parts of all pieces for extra support, or attachment without damaging a real tree! Great for your Halloween haunted house cemetery graveyard lawn yard scene! Head approx 11-inch tall x 6-inch wide x 3 inch deep (27.5x15x7.5cm). Arms approx 17-inch long with a 5.5-inch hand span.